So I have a bit of a crush on the editors of Food52. It is a beautiful food site with a wealth of amazing food ideas. I always find myself learning a little something whenever I peruse their site, that is if I do not get sucked into browsing their gorgeous online shop. 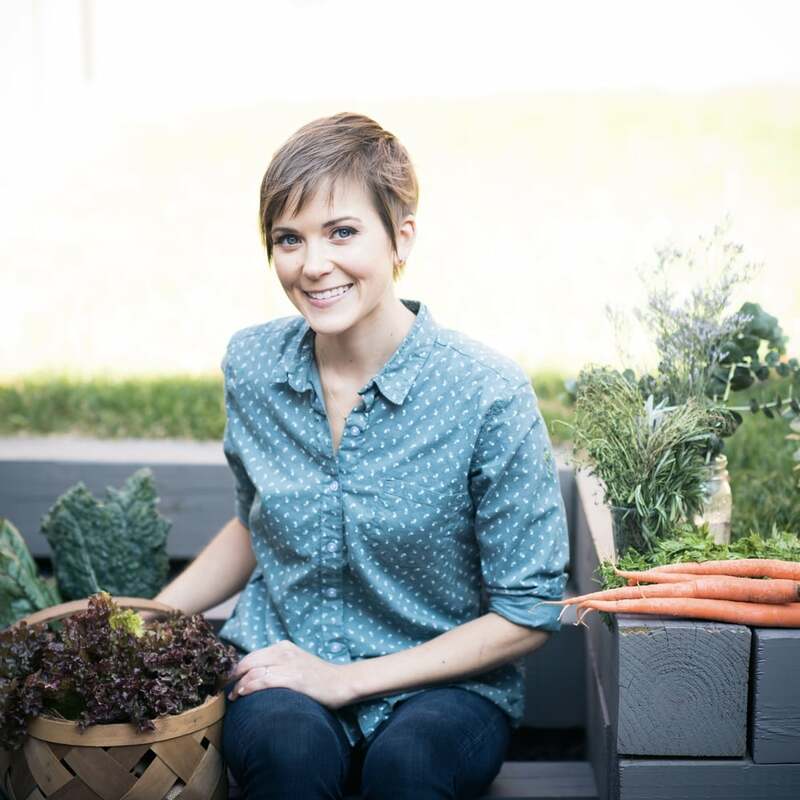 I was pumped to go to a free event with fellow foodie and blogger, Grace, at the Free Library of Philadelphia the other night that featured Merrill Stubb, co-founder of Food52, and Kristin Miglore, executive editor and the writer of their weekly Genius Recipes column. They were promoting their new book Food52: Genius Recipes. I honestly did not know too much about the book before going, but I left completely inspired (and still thinking that they have the coolest job ever and wish I had said coolest job). The idea behind Genius Recipes is that each recipe features a little tip, technique, or ingredient combo that will really up your cooking game. They may seem a little odd at first and perhaps go against normal cooking rules, but then they totally, magically work. They discussed how lemon juice can turn cream into a magical dressing for figs, how salt on yogurt is their new go-to breakfast, and how cooking broccoli forever is actually not the worst idea ever. This recipe is inspired by the recipe they discussed, Roy Finamore's Broccoli Cooked Forever. You can find the recipe in their new book, but it also here on their site. You blanch broccoli, add it to an olive oil, garlic, anchovy, and chile mixture, and simmer it on the stove, covered, for 2 hours. After 2 hours, you find murky green broccoli that they describe as a "miraculous substance" that can be smeared on bread, pureed in soup, tossed with pasta, or just eaten by itself. Supposedly all the cruciferous funkiness mellows and broccoli almost becomes a little sweet. Seems pretty awesome, right? Considering I had no broccoli but loads of zucchini, I decided I would have to try this sort of vegetable "confiting" with my zucchini. And boy, is it delicious. And foolproof. And low maintenance. But also, a little ugly. This is most definitely one of those don't-judge-a-book-by-it's-cover recipes. It looks pretty anemic, but I promise that the flavor is not. I did not have any anchovies so I decided to mix in some miso paste instead, and I love the umami richness it gave. I let it cook for about 80 minutes, less time than the broccoli because it is a much softer vegetable. Because it cooked for so long though, the miso takes on a bit of sweetness, too. You could make a big batch of this and find all sorts of uses for it. 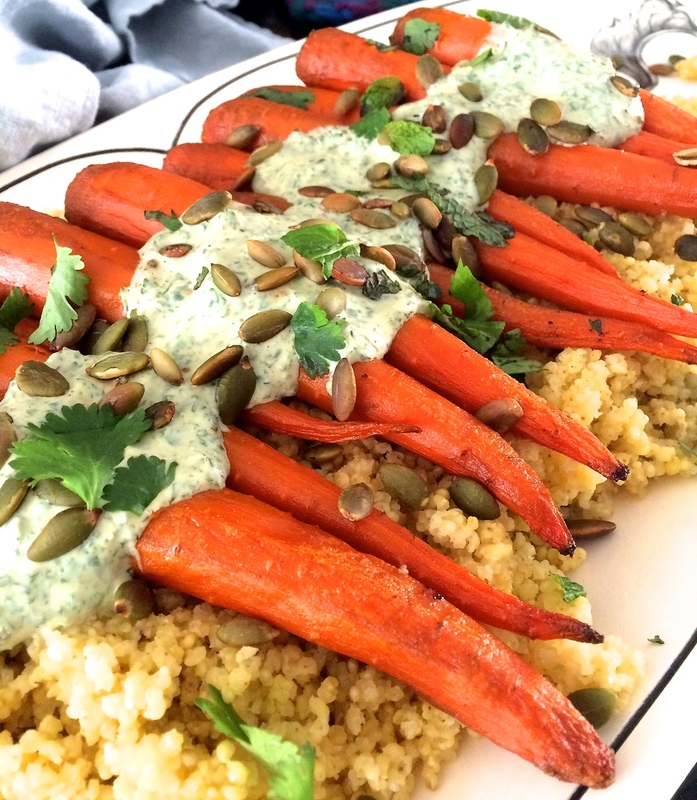 I served it on crostini here, but I tossed it in with some cooked brown rice and feta cheese a little later. And I'm planning on smearing it on a pizza before the summer ends. And if you find this intriguing, check out Grace's beautiful rendition with summer greens from her backyard garden. In a large bowl, use your fingers to smear the sliced zucchini pieces with the miso paste as best as you can. 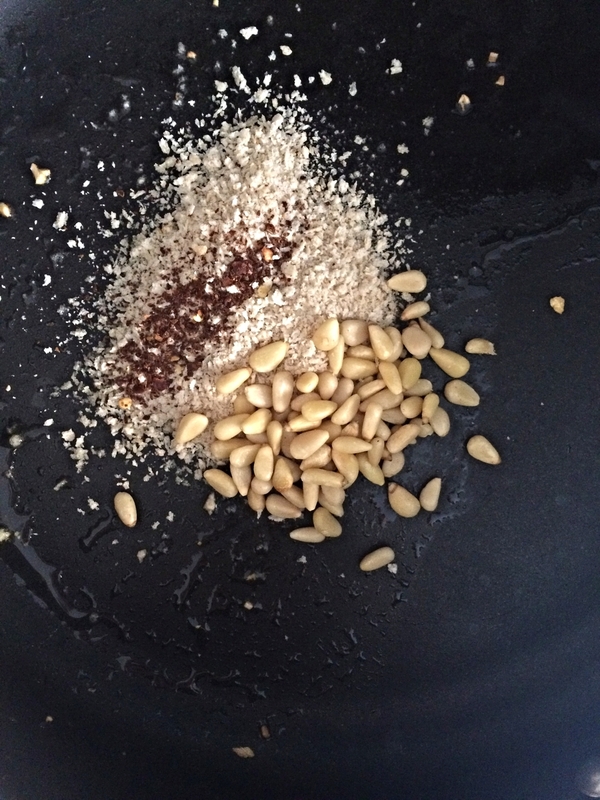 Heat the olive oil and sliced garlic over medium heat in a large skillet. When the garlic begins to sizzle, add the chili flakes. Add the coated zucchini pieces and a pinch of salt and stir to combine. Cover and reduce heat to very low. Cook for about 1 hour and 20 minutes, stirring every so often to distribute the zucchini, being careful not to mush zucchini. Remove from heat, uncover, and let cool. Add salt and pepper to taste. Enjoy warm, at room temperature, or slightly chilled. Makes about 2 cups. 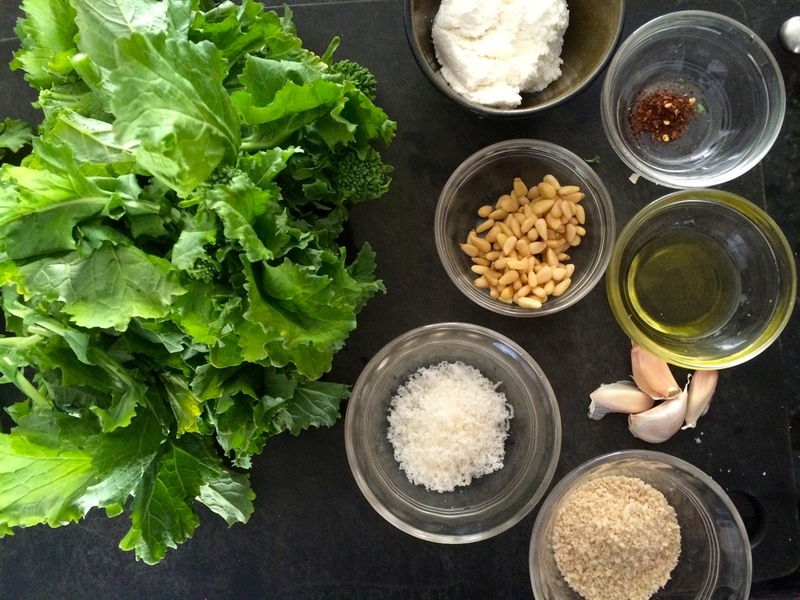 Broccoli rabe, also known as rapini, is wild looking vegetable. You can often find it in the produce section attempting to be tamed by a twist tie that is at capacity. As soon as you undo that little wire, it's you versus the broccoli rabe as it unfurls itself all over your kitchen counter. I learned early on that the trick lies in chopping as much of it as you can with the twist tie still secured in place. That way you control it, not the other way around. Even its flavor is a bit wild. Its leafy bitterness begs to be tamed by a healthy dose of some kind of fat. Here in Philadelphia, especially at Tommy DiNic's, that richness most often takes the form of roast pork and sharp provolone on a soft Italian roll. Having lived in this city for almost four years, I would argue that this sandwich epitomizes Philadelphia food scene even more than the Philly cheesesteak, at least among Philadelphians. However you decide to try this, it is best to wait until close to serving to add the crunchy garlic and breadcrumb mixture. I can say, that after eating many versions of this as leftovers, it is still delicious, even if it is just a teensy bit soggy. Prepare the broccoli rabe first. Bring a large pot of water to a boil. While the water heats, remove the tough bottom stems of the broccoli rabe and discard. Chop the remaining stems and leaves into 1-inch pieces. Add 1 teaspoon of salt to the boiling water, and add the broccoli rabe. Turn heat to medium and allow broccoli rabe to cook for about 3 minutes. 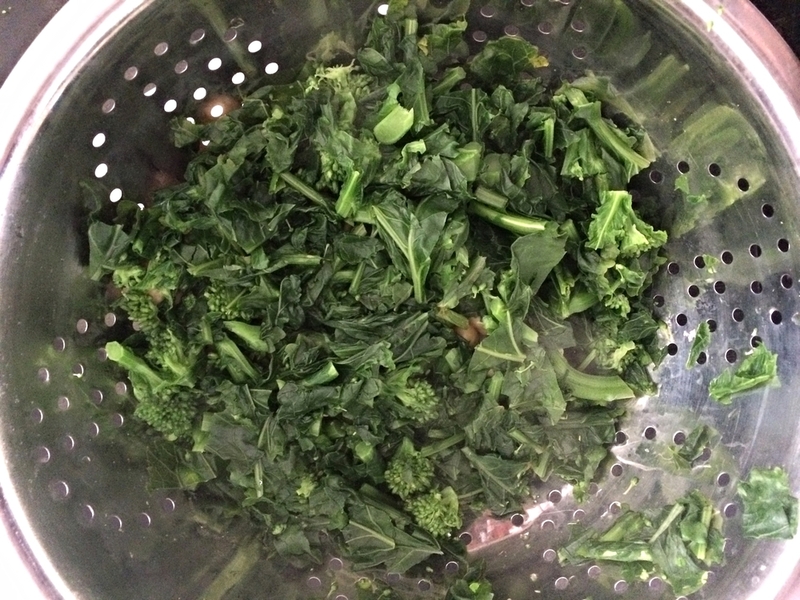 Drain in colander and set broccoli rabe aside. Make the garlic oil and topping. Heat 2 tablespoons olive oil over medium heat. 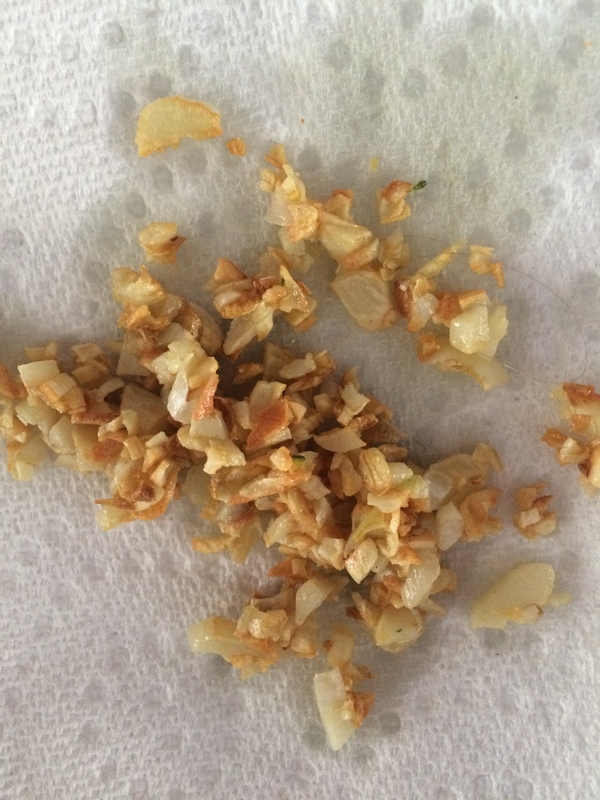 Add the chopped garlic cloves and cook, stirring often, for 8-10 minutes or until garlic turns golden and starts to crisp. Be careful not to burn. Remove the garlic from the pan with a slotted spoon and allow to drain on a paper towel. 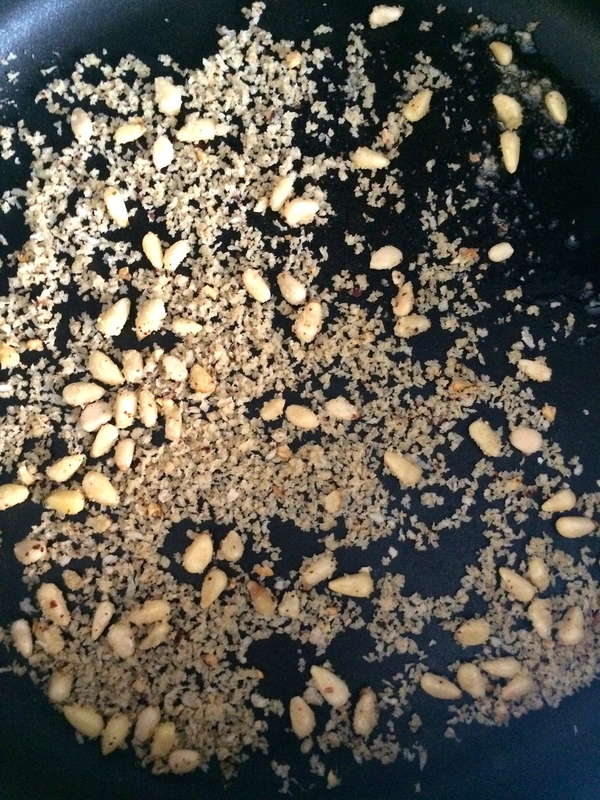 Add the breadcrumbs, pine nuts, and red pepper flakes to the oil remaining in the pan, and cook for 8-10 minutes while stirring, until breadcrumbs turn deep golden and pine nuts become toasted. Remove from pan using a slotted spoon and place on the same paper towel as the garlic. Add another 1 tablespoon of olive oil to the skillet with any residual oil and heat to medium-high. Add in the drained broccoli rabe, the cooked chickpeas, and a sprinkling of salt. Stir to combine, and cook for 5 minutes until everything is heated through. Remove from heat, sprinkle in 1 tablespoon of cheese, and stir. 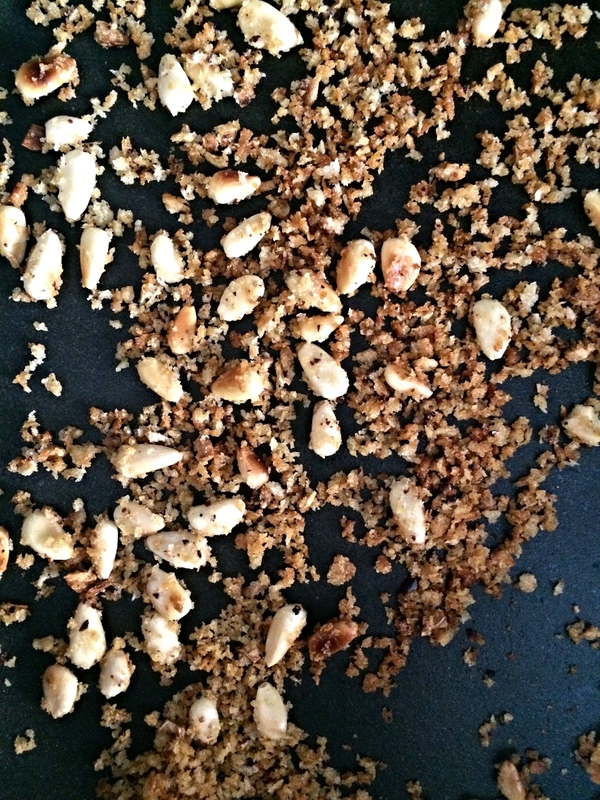 Prior to serving, sprinkle with the remaining cheese and the garlic, breadcrumb, pine nut mixture. Enjoy! Serves 4 as a side dish, tops 1 pizza, mixes in with 1 lb. of pasta, tops 4 sandwiches, or tops several crostini.